Peanut Butter from The Protein Works™ is ultra-pure, made simply from 100% natural roasted peanuts. Unlike standard peanut butter, TPW™ Peanut Butter contains absolutely no added sugar or salt. Furthermore, it is produced right here in the UK and comes in Simply Smooth and Super Crunchy versions. Peanut Butter has an incredibly versatile nutritional profile and is widely considered to be one of nature's best sources of protein, carbs and fats. Incredibly versatile, you can consume our Peanut Butter on its own to help curb cravings, supercharge your protein shake with a spoonful, use in recipes or simply spread on whatever you like. Made in a factory that handles dairy, eggs, gluten, nuts, soya & yeast. Product should be kept sealed and checked at regular intervals whilst in storage. Oil may separate during storage, this is normal and can be mixed prior to use. Use in conjunction with a balanced diet and regular exercise. 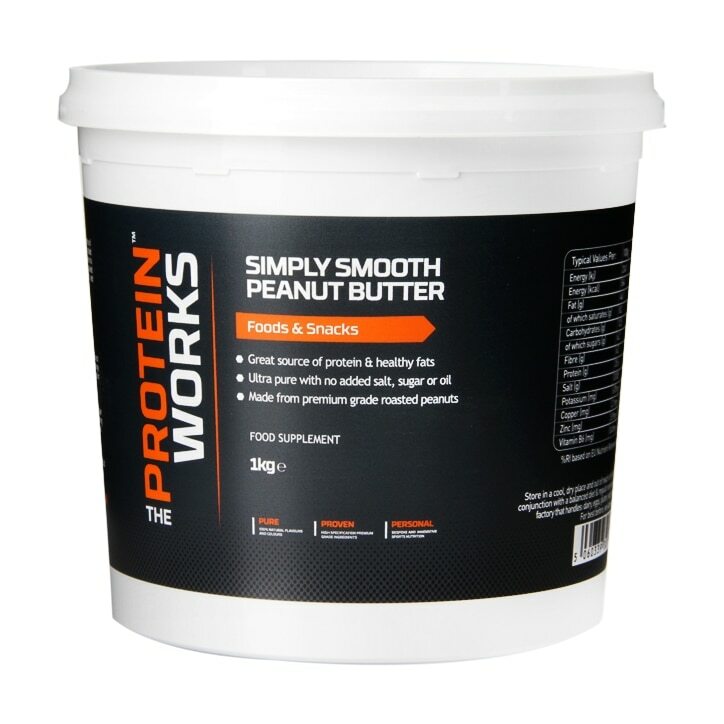 The Protein Works Peanut Butter Smooth is rated 4.6 out of 5 by 16. Rated 5 out of 5 by Jopastel from Very smooth, test great! I got this product few days ago slightly different than the one we normally get, we find it smoother, easy to mix and slightly cheaper. overall very happy with the product. Rated 5 out of 5 by Isis from Tastiest Peanut Butter You HAVE to try this!!! This is so much better than any peanut butter that I have tried. Nut explosion is one way to describe it... but also pure nut goodness.... so tasty... so natural!!! Rated 5 out of 5 by Tomko3369 from Probably the best tasting peanut butter I’ve tried around 60-70 peanut butters but this is definitely the best so far, if only it was crunchy but still great taste. Rated 5 out of 5 by Becca20 from NOM! I got this as the “super crunchy” one was out of stock but needless to say it is still divine! If not better as spreading is a bit easier due to no peanut bits-Would definitely but again and may even favour over the super crunchy version. Rated 5 out of 5 by Charlie1kinobee from Great value By far best value for money in terms of quantity and quality!